In a seminal conference organised by CSAN (Caritas Social Action Network) The Most Rev Vincent Nichols, Archbishop of Westminster, is due to set out the Catholic Church in England Wales' response to rising levels of domestic poverty. Speaking alongside eminent theologians and leading politicians Archbishop Nichols will say that Catholics working in social action "give practical expression to the Church’s core mission so powerfully expressed by Pope Francis – to be a Church that is poor, and for the poor." CSAN's conference: 'the Catholic Response to the Poverty Crisis' is taking place at St. Mary's University College in Twickenham this week (June 12-13) bringing together clergy, Catholic charities and members of the laity to strengthen the Church's support for the growing number of families facing hardship. The first thing I want to say is thank you. Your efforts to address the rising levels of poverty in our communities make a genuine difference every day. Your work is transformative for many on the margins of our society. You give practical expression to the Church’s core mission so powerfully expressed by Pope Francis – to be a Church that is poor, and for the poor. Alongside direct support, you also are a voice of the Church speaking in the public square on behalf of the poor. I am very encouraged that representatives of both the government and the opposition have been to this Conference to hear from your own experience of the key issues facing vulnerable individuals and families. I look forward to this dialogue continuing. It is also good to know that the same is true of several of our partners from other Churches and charities. It is by standing shoulder to shoulder, working towards the same goal, that we are best able to assist those in need. 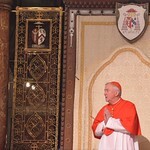 Before our closing Mass I would like reflect briefly on what is distinctive about our contribution to this vital work. We wish to witness to the truth that those in need are the ‘very flesh of Christ’. This means that those who are hungry, or homeless or in prison have something of Christ to give to us. Through them Jesus knocks at the door of our hearts, at humanity’s door, wishing to be let in, calling on us to step outside of ourselves and be liberated from our selfishness and self-satisfaction. This is the distinctive motivation for the Christian’s hunger for a fair distribution of food and the means of producing it, so powerfully on display at last week’s gathering for the G8 hunger summit. The poverty of the Church begins when we Christians forsake our sense of self-dependence and realise our poverty before God. It happens when we admit our own failings and seek God’s mercy. When we embrace our own poverty then we see ourselves as truly a brother and sister to those whose poverty is also material and physical. Without that radical sense of our own need, we may well approach the needs of others as a technical problem to be solved. But then they become an object, and are not truly of our same intimate family. The distinctive character of Catholic agencies, at root, is a heart that sees, feels and shares the needs of the other as one with our own needs– this is Caritas. What is the true motivation of our action? As Mother Teresa once said: “It is not how much you do, but how much love you put into the doing that matters”. Catholic Social Teaching, as we know, brings this gospel perspective of love to the problem of social structures: that is, ways of organising social institutions so that they truly serve humanity and place the good of the person centre stage. Love and justice go hand in hand. As Pope Francis recently reminded us, the Church is “neither a political movement nor an NGO.” Instead, as was made so clear by the Archbishop of Toledo in a recent interview, she offers her social teaching to all who struggle with today’s dramatic problems. This teaching has some vital things to contribute both to political life and the way in which social institutions, such as NGOs and businesses, need to operate if they are to serve the common good of humanity. Work occupies a vitally important place in Catholic Social Teaching. It should therefore remain a central focus of our Church’s efforts in the struggle against poverty. For many employment presents the most effective and sustainable route out of material deprivation. Furthermore there is widespread acknowledgement of the intrinsic moral value in work, manifested through positive influences upon self-esteem, emotional wellbeing and family life, provided those in work are treated justly and fairly paid. From Rerum Novarum onwards the Church has insisted on the rights of fair pay so that employees can meet the needs of their families. This concept has in very recent years gained momentum through minimum wage legislation and now the Living Wage scheme, endorsed by political leaders and accepted by hundreds of businesses. And yet, in-work poverty is simultaneously gathering pace: more than five million workers bring home an income insufficient to cover basic outgoings, the significant majority of child poverty exists in working households, and low paid workers now make up the largest group relying on food banks for their meals. This lays down a challenge not only to the state but to the private and social sector - indeed to all those upon whom people depend for their livelihood. The Church itself is no exception. Since the Bishops’ Conference Resolution last year on the Living Wage, our Secretariat, CSAN, CAFOD and the Catholic Education Service have all been accredited as official Living Wage Employers. Naturally for many employers, moving towards the Living Wage is a difficult and gradual process which must be balanced with other commitments and demands. However, it is crucial that we tirelessly strive for just pay throughout society as a whole, if work is to provide a viable escape from poverty. At the same time it is vital to appreciate that for many people employment is not an option. In some cases this may be due to temporary factors such as a shortage of available jobs or a personal illness that can be overcome only gradually. For others there are longer-term barriers such as severe disability or the need to provide full time care to a relative. In either circumstance, appropriate support should be available to ensure that the absence of earned income does not result in unsustainable hardship. A social safety net that fails to protect essentials such as food and shelter for those who cannot work, is not worthy of being regarded as a safety net at all. Throughout our communities we are witnessing an increasing number of families going without these very necessities. I understand that there are growing numbers of hungry pupils in classrooms across the country and many accounts of parents foregoing their own meals in order to provide for their children. In response to these circumstances, there are many church congregations and charities stepping forward, providing a safety net where no other exists. From parish food banks and school breakfast programmes to professional support services, your work is often the only thing standing between families and destitution. Without the tireless work of Catholic charities, alongside our partners in other Churches and faith groups, the poverty crisis would be undoubtedly far deeper and far more widespread. It is somewhat fitting that this Conference concludes on the feast of St. Anthony of Padua, a day strongly linked with the tradition of offering bread to those in need. Drawing upon this experience we must not shy from adding our voice to public debate. Catholic Social Teaching does not offer a ‘magic wand’ to solve the dilemma facing many governments today struggling to contain welfare budgets in difficult times. There is an unavoidable trade-off between various policy objectives, each of which is always in tension with the others: alleviating poverty, removing disincentives to work, containing public expenditure and stimulating the economy. The moral insistence is to attend first to those who are most vulnerable, and at present that includes rising numbers of children. Everyone working in the field therefore has a responsibility to convey accurately and compassionately the reality faced by those in poverty, and to counter the misconceptions often put forward that risk distorting society's reaction. The insights of our social teaching also have much to say about the vital importance of intermediate institutions between the state and the market, and how to build structures of virtue in society that will support human flourishing. At the heart of the Church's mission, and particularly pronounced in this context, is the importance of family. The true value here runs far deeper than any protection that families can offer against poverty in monetary terms. Within a sound family, the unique mutual support and compassion sustained between its members, means that those in hardship are almost invariably better able to face their challenges and fashion a future. And within the family, too, the next generation of people are inspired to strive for a better society, with respect for the struggles and successes of earlier generations. In a phrase, if we forget the achievements and virtues of the past then we will lose our future, too. The challenges ahead are numerous. But with the expertise and unwavering dedication of all here today, your colleagues, and your partners, the Catholic response to the poverty crisis will continue to be one that changes lives and furthers the Common Good.